Towards the vision of “A world-class university, in continuous pursuit of innovation and excellence”, BINUS UNIVERSITY continues to provide opportunities for students to gain international experience. One possible avenue to reach that goal is through a student exchange program with international partner universities. Building in that spirit, BINUS UNIVERSITY and Yamanashi Gakuin University, Japan, agreed to develop a student exchange program cooperation. 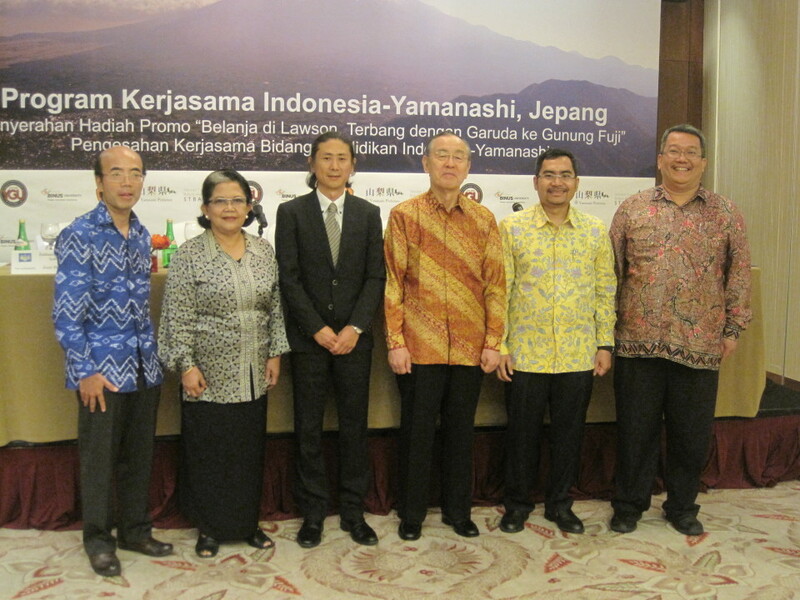 This collaboration is marked with the historical MOA signing ceremony by Professor Momotoshi Mara, Director of International Affairs of Yamanashi Gakuin University and BINUS UNIVERSITY, represented by Dr. Ir. Boto Simatupang, MBP as Vice Rector of Global Employability and Entrepreneurship on Wednesday, 16 October 2013 at Mandarin Oriental Hotel, Sudirman.